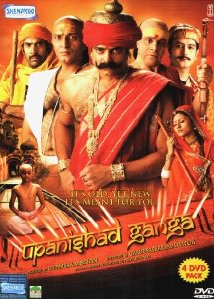 Episode #20 of Hindi TV Serial Upanishad Ganga continues the 3 episode series on 16 Samskaras (aka Sanskar or Sanskara). Samskar or Samskara is a broad word and it includes many other things in addition to characteristics and embodiment. Each sanskara should do (ideally) human embodiment of purification in one’s life. This episode continues talking about the 9th sanskara (samskar) – that is about ear piercing. The main reason behind this act is the science of acupuncture and other such proven ways to take care of health. While doing this, actually the father (or elders in the family) chants blessings and prayer to the God in the ears of the kid. The idea is to wish that the growing kid will be blessed to hear meaningful and good things only. All these rituals are about making the kid a better human being over the age. Yagyopavit (aka The Sacred Threads) is very important. It is a reminder of 3 duties one need to perform in the life along with the 3 responsibilities he/she (in earlier days even females were used to wear the sacred threads) holds. Yagyopavit Upanayan is done with the teaching of the famous Gayatri Mantra. Just search for its meaning over the Internet (yeah, we love to see you exploring some important stuff on your own also :)), and you will realise the broad meaning of the same. There is no doubt that this episode covers two important sanskaras and that’s why it is worth watching. Even more important is the exploration of the life of sage Soordas. Being a blind since the beginning he has kept away from all the love, affection and many such important events in his life. See how he breaks down when talking about his own childhood to Kanhai! What a fantastic acting by Ravi Khanvilkar who plays Surdas/Soordas in this episode. His dialogue delivery and body language both are in sync and he does complete justice to his role. Other actors try giving their best support to him. You must notice the dialog delivery of the actor who plays Akbar. Meeting of King Akbar along with Tansen to Soordas adds some (comparatively) modern touch to the episode content. It is worth to listen to their conversation with Soordas. Also, see when someone else enters to meet Soordas, Kanhai runs away! Obviously, because he was there for Soordas only. The makers have taken care of smallest details. For example, you can notice playing of Madhurashtakam in the background. Madhurashtakam is a prayer of Lord Krishna authored by Vallabhacharya himself! Of course, entire Madhurashtakam was not played in the episode it was only just one verse of it played. But, such detailing makes the episode even more valuable. Well, good acting and detailing can be effective only when the content is good. And, the script writer has done a good job. Especially mixing Soordas’ biography with the Sanskaras works great. The research team also deserves a mention here. The background music is really good. We have expected better (executed) songs in terms of Padas by Soordas and Tansen’s song both. A little disappointed with the execution there. There are no larger than life sets there and no rich wardrobe is shown. You, however, will not miss it for a bit. And that proves the quality of this episode. Overall a nice episode which explains the deep meaning of various rituals suggested in Indian mythology to be executed at various points in one’s life. We recommend to watch it. And, buy DVD set if you can afford it.